This News Bulletin describes a collision between a Tatmadaw military truck and a villager’s motorbike in Thandaunggyi Township, Toungoo District on May 3rd 2016. 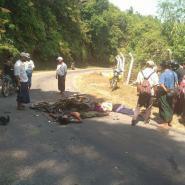 The two villagers who were riding the motorbike died in the incident. 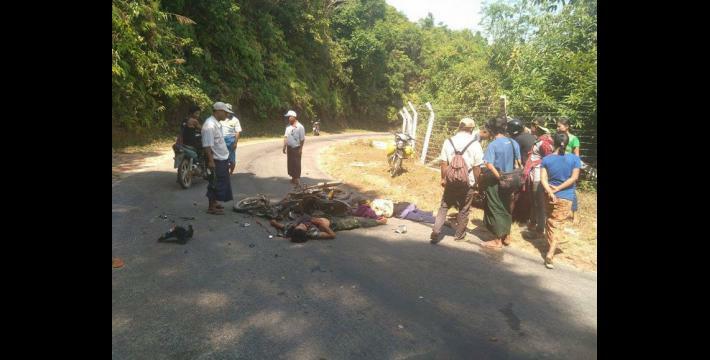 The Tatmadaw continued driving after the collision without taking care of the villagers. The local villagers thought the Tatmadaw Light Infantry Battalion (LIB) #124 was responsible for this incident so they reported it to the police who then went with the villagers to the #930 Supply Unit to investigate the case. The military truck driver Ko Ye who was involved in the incident had already fled when the police found out about the case. At the time of writing, the police are continuing their investigation and the perpetrator has yet to be located. On May 3rd 2016, the LIB [Light Infantry Battalion] #124 from Thandaunggyi Township, Toungoo District were transporting rations with military trucks to a place which is about 100 yards away from the Tatmadaw officials’ dormitory when they collided with a motorbike being driven by two people who were both killed immediately. The LIB #124 were transporting their monthly rations from the Southern Command Headquarters to Thandaunggyi Town for their frontline soldiers on May 3rd 2016. There were 12 trucks transporting the rations. The first truck in the line collided with the villagers. They were Saw Maw Gay, who was 22 years old, and his mother Naw Tha Ku, who was 47 years old, and they were both from Le Me Gyi village, Thandaunggyi Township, Toungoo District. The number plate of the truck that hit the two villagers is 8157(ဗ) Ding Feng and the driver’s private military code is တ/409166. These two people died immediately when they were hit by the truck and the 12 trucks did not help them. They briefly stopped to check the bodies and then they drove back to their military camp. Some villagers who were travelling on the road and some of the local people who live close to where the incident happened found the dead bodies and informed the Christian monk in Thandaunggyi [Town]. The Christian monk then went to the place where the incident happened and questioned people and then reported the case to the Thandaunggyi police station. According to the local villagers, civilian cars were traveling on the road that day but there was no incident involving those civilian cars. The Southern Command Headquarters transported their rations on the day that the accident happened and, as the villagers do not trust Supply Unit #930, they went to the place where the military trucks were parked. The incident did happen [according to the researcher] but they [Supply Unit #930] denied it at first, and so the villagers and police checked every single military truck and they found the blood and motorbike front casing pieces on the wheel of the truck that private Ko Ye had driven. The other truck drivers also admitted that the incident had happened and they said that the driver Ko Ye had escaped as soon as he arrived at Supply Unit #930. They [Ko Yeh and the officer in Supply Unit #930] did not do anything with the two dead bodies. The villagers put the bodies in a church in Thandaunggyi and the church members then had to take care of everything including the cremation of the bodies. The Christian monk also tried to help to bring Ko Yeh to justice but he had escaped after the incident. However, according to community members, the Christian monk said that at the moment the perpetrator has still escaped and the Tatmadaw military leaders do not know where he has gone either. This News Bulletin was written by KHRG office staff and is based on information from a community member from Toungoo District who has been trained by KHRG to monitor local human rights conditions. It summarises information from three incident reports, one situation update and one interview received by KHRG in May 2016. In order to increase the transparency of KHRG methodology and more directly communicate the experiences and perspectives of villagers in southeast Burma/Myanmar, KHRG aims to make all field information received available on the KHRG website once it has been processed and translated, subject only to security considerations. For additional reports categorised by Type, Issue, Location and Year, please see the Related Readings component following each report on KHRG’s website. This information was included in an interview received by KHRG in May 2016 from a KHRG community member from Toungoo District.